I’ve talked in previous articles (ie. Speed Kills) about the importance of straightness of the fore limb. A quick summary goes something like this; the horse’s front legs act as supporting/foundation pillars. Crooked supports and those too thin for the weight above crack and eventually break. If a person plans to ride their horse on its forehand, do speed events, race their horse, jump it or any other activity that stresses those front legs by specifically weighting and torquing them, then straightness and substance should rate high on the conformation criteria scale. If, on the other hand, a person plans to correctly gymnasticize their horse asking for a shift of weight rearward onto the spring-like hind limbs on a consistent basis, and be considerate of the horse during cross-training, then fore limb crookedness and substance, while still important, can drop a notch. 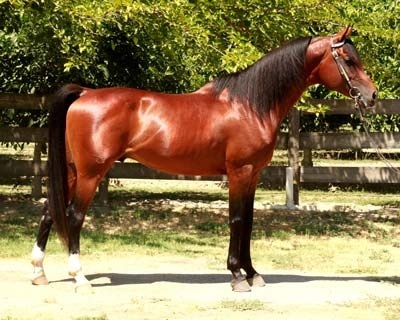 The conformation pictures we have of our sample horses do not allow us to view much in the way of front limb crookedness, so when considering a horse for purchase or breeding one should insist on additional views. There are still some important conformation aspects we can look at from our side view shots; knee alignment, pastern and cannon bone length, pastern slope and toe to heel foot balance. 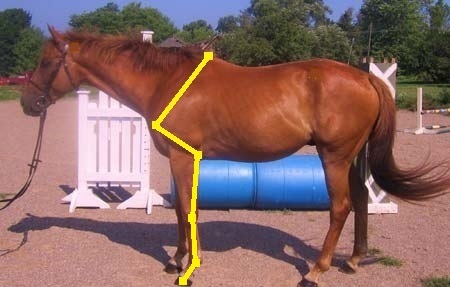 Knee alignment – when viewed from the side, the horse’s knee should ‘pop’ out a little bit. If there’s a perfectly straight line down the front of the leg then the horse is too straight through the knee and calf-kneed. This is a significant fault, and if the knee falls clearly behind that line it becomes a serious fault on similar terms to ewe-necks, post leggedness and poorly placed LS joints. If the knee ‘pops’ too much, it’s also a fault, though not as severe as calf-knees, and is called over-at-the-knee, or buck knees. You’ll see this latter type of knee fault quite frequently in Thoroughbreds. Note: Farriers should never try and ‘fix’ these kinds of knee conformation faults by trimming feet to lessen the effects. And yes, many do try. The last horse I worked on that was significantly over-at-the- knees and had a farrier trying to shoe it out of the horse, the horse broke a coffin bone from the stress being placed on the foot. The horse also suffered from significant pain at the base of his neck, through his shoulders and withers. Pastern and Cannon bone length – there’s no specific measurement for cannon bone length. It’s an eyeball measurement about what constitutes longer vs shorter, however, if the horse’s knee is placed relatively high in relation to the ground, the cannon bone length is likely to be long and if the knee is relatively low in relation to the ground, the cannon bone length is likely to be short. A short forearm is often accompanied by a long cannon bone, but not always as in some cases a long scapula, short forearm, short cannon bone can exist. While people may disagree on cannon bone length in a specific horse, most everyone will agree that a short cannon bone is preferable for almost all horses. Longer cannon bones would be part of the requirements for the action of gaited horses. Fortunately, pastern length is much easier to determine. If the pastern is greater than 75% the length of the cannon bone, the pastern is long. If the pastern is less than 50% the length of the cannon bone than the pastern is short. The slope of the pastern should be such that it can absorb concussive shock. It does NOT have to be equal to the horse’s shoulder slope and it is not a fault if the two are different. Note: Farriers should not try and make a horse’s pastern slope equal to the horse’s shoulder slope through trimming or shoeing means. And yes, some do. The foot should always be trimmed for balance in direct relationship to the underlying foot structures, not outward appearances. Pasterns that are overly sloped can place too much stress on tendons and ligaments, straining or tearing them, and can also cause the horse to smack the back of the fetlock on the ground, risking fracture of the sesamoid bones. Pasterns that are overly upright reduce the ability to absorb concussive shock, in turn creating abnormal wear and tear on joints and bone, early onset of arthritic conditions and stress fractures. 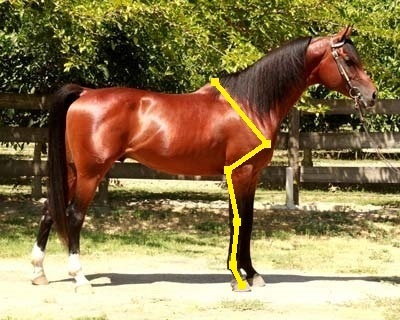 In this area the best structure for the horse is a medium pastern length of medium slope. While longer, more sloping pasterns can provide a ‘softer’ riding experience, it is at the possible expense of the horse’s soundness. By the same token, short, overly upright pasterns should also be avoided. It should be noted that short, or upright, or short and upright pasterns do not in and of themselves created a ‘short and choppy’ stride as is often reported. It is the humerus bone, its length, horizontal orientation and/or the existence of a closed shoulder angle that creates a ‘short choppy’ stride (as discussed in a previous article – The Up And Down Of It – Humerus Bone). What a short, or upright, or short and upright pastern will do is create a more ‘jarring’ riding experience. Foot balance – this topic really requires an entire article or two or three of its own, but I did want to mention here that foot balance or foot imbalance can be the difference between night and day for a horse, how it stands, how sound it stays, and how well it performs at any level. Some horses are more sensitive to foot imbalances than others. Typically horses with good, solid and relatively proper bone structure above can stand up better to foot imbalances, often not showing signs until years later. By the same token, more stoic, survival intense personalities or those with strong constitutions will be less sensitive to foot imbalances as showing weakness to the world means certain death. Regardless of the horse, this is one area that the average horse owner doesn’t pay enough attention to by taking the quality of farrier work as a given. After all, they are the professionals so they should know, right? Wrong. Like any profession there will always be members who are poor, most will be average, and a few will be excellent. The saying, ‘no foot, no horse’ exists for a reason – because it’s true. I can’t emphasize the importance of proper foot balance for horses enough. If you’ve never thought about it before, you should be getting that awful pit in your stomach feeling right now that you’ve missed something really important all these years. Yes, even if your horse/s aren’t currently head bobbing lame or have/are performing successfully. Now it’s time to take a look at our sample horses and see how they measure up. This horse is too straight through the knee and therefore is a bit calf-kneed. We measure the cannon bone from mid knee to mid fetlock joint and we measure the pastern from mid fetlock joint to P1. Then to get our pastern percentage we divide the pastern measurement by the cannon bone measurement. This horse has a short cannon bone and his pastern is right about 50% the length of it. His pastern is also upright. Without actually being able to measure the circumference of his cannon bone to determine if he carries the minimum requirement of 7” per thousand pounds, we’re going to have eyeball it. IMO, I don’t think this horse carries quite enough bone. When we consider that this horse is also downhill built putting more weight on the forehand, we might begin to get nervous about the prospects of him staying sound. Those upright, shorter (but not technically ‘short’) pasterns are going to reduce his ability to absorb concussive forces, which puts even more strain on the calf-knees, which is as I mentioned earlier, is a pretty serious fault. While I’m not embracing what I see so far from this lower limb, I’m not entirely turned off and here’s why: the horse is the sum of his parts and as far as we’ve delved so far, this horse has a superior loin and haunch. 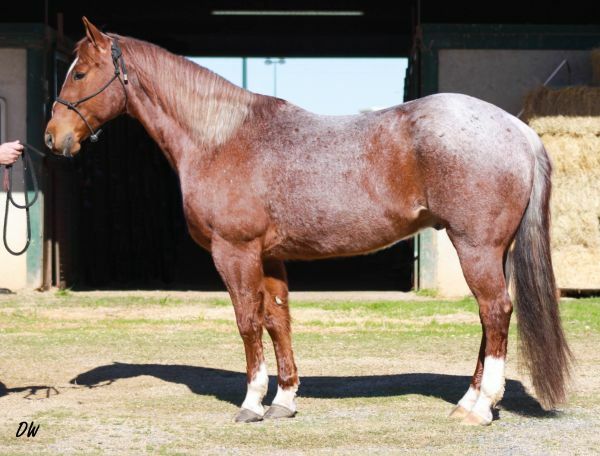 That means that if this horse can utilize his haunch, he’ll be able to lift weight off his forehand relieving tremendous stress off those forelimbs. We can then be more forgiving of the imperfections up front. 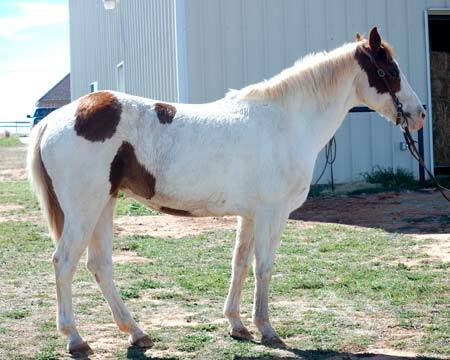 Since he is a stallion, it would be prudent to get that front view angle photograph to further assess the straightness or crookedness of the front legs. If it turned out that everything else was in order, and the stallion had proven himself in performance (and stayed sound on those front legs), then at that point (and assuming we don’t find anything else we don’t like going further in this conformation study) a complementary mare would be one that possessed perfectly aligned knees and pasterns that sloped a bit more generously. If she also possessed a touch more length to those pasterns, that would be a bonus. We can’t see this horse’s feet to comment in that regard. Your first inclination may be to say that this horss is also calf-kneed, but he’s not. His stance of front legs too far underneath the body can give the illusion of calf-knees. If he was standing correctly, he’d have perfectly aligned knees from side. They also appear to be of substantial size. In general this horse carries more substance than our QH stallion. 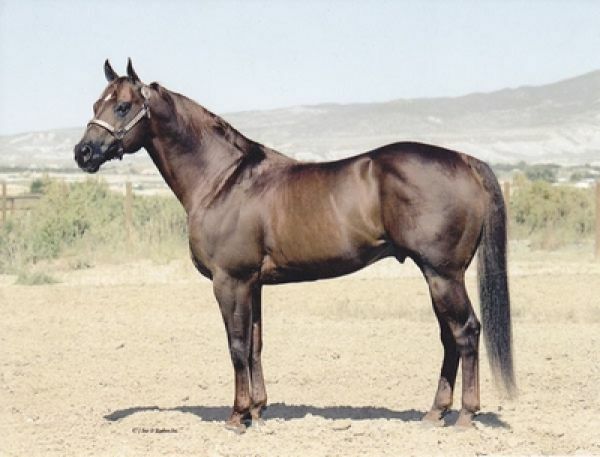 His cannon bone is short and his pastern is an ideal medium length, though more upright. This horse is also short in his forearm with a lot of fore limb length taken up by his scapula. This isn’t a fault, but it affects lateral movement. A horse structured like this may find he hits himself if asked for too deep a lateral movement, particularly if heavy on the forehand. Fortunately, he has that good length of humerus bone to help. The big issue for this horse is his feet. Here we can clearly see those front feet are horrendously unbalanced, such that he’s actually broken back in the pastern. Undoubtedly the feet are why this horse is standing awkwardly in front on the points of his coffin bones. If this horse isn’t obviously lame on these front feet, it’s a wonder and the owner can thank this horse’s otherwise solid bone structure and stoicism. 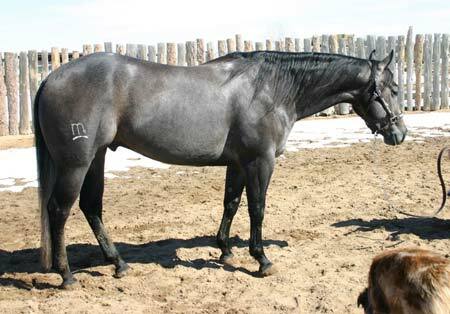 This horse has a well-aligned knee and short cannon bone. His pastern is as the upper most end of medium in length and has a very pleasing slope. The only thing that would make this lower leg combination better is a bit more substance, otherwise it’s very good and very functional. We can’t see this horse’s feet to assess. I’ve talked a bit about this horse’s front leg issues in a previous article (or comments section). His knees are higher than ideal from cannon bones longer than ideal and this gives him a shortened forearm. His right knee is bucked a bit and the right pastern more upright than the left because of his obvious clubbed foot. The pastern length is otherwise fine. I’m not a fan of clubbed feet, even though many horses go on to have serviceable lives, some even in higher performance. Club feet are hereditary and require an above average skilled farrier to recognize them, not try to fix them etc… This horse shows quite a bit of difference between those front feet – even with the left front foot also showing a clubby look – and difference between legs (steeper pastern, higher fetlock and knee joint, bucked knee) such that that unevenness has no choice but to carry on up his limbs, into his shoulders, into his withers, into his neck, and along the length of his back. He’s only four in this picture, but as he ages the asymmetry in his fore limbs is going to wear on his body. When I also take into account the serious fault of his table top croup and the camel withers, which we’ve discussed before, I can only conclude that the best thing to do for the breed is to cull this one and geld him no matter how good the rest of his conformation that we have not yet talked about. Our TB is as straight through the knee as we want to see. It’s actually quite nice seeing one that isn’t over-at-the-knee or tied in. Here we have a horse that stands over a lot of air and that’s essentially because he’s got a lot of leg length in general. Even though he has excellent bone proportions throughout the entire limb, his cannon bone and pastern are on the longish side of things. He also lacks the most substance of all our sample horses. On the positive side of things, his joints, tendons and ligaments look very clean. If a front view revealed good straightness throughout, this isn’t a terrible set of front legs by a long shot. They’re functional and with a little consideration they should serve this horse well enough. We can’t quite see all the front feet, but we can determine for sure that this horse doesn’t have those ‘racetrack’ feet. He might be a bit boxy in those front feet if anything. One other thing I’d like to point out is the muscling of the forearm. Take a moment to scroll back and compare the amount of muscling on our TB and Arab to our three QH’s. While we expect there to be a difference, it’s a bit too much. Our TB, in particular, is lacking in this department. It’s really hard to see this horse’s knee alignment. I think she’s okay, though. Her cannon bone length is okay, as is her pastern length and slope. Her feet on the other hand are not balanced and do her no favors. I’d like to see her carry a bit more bone as well. If I was teacher and she a student, she’d easily get a passing grade on this subject, but I’d write to her parents that I felt she’d underachieved somewhat. Her legs are good enough for our TB to stay sound on, but she’s not our TB. She’s our Paint mare with the weak loin, the too long scapula, the too low point of shoulder, the downhill build, the bit too long back, the bit too short and a bit too horizontal humerus, and we haven’t even got to that neck yet. This makes me want to see that front view of her fore limbs because any crookedness there and my thoughts about her being able to stay sound on them becomes debateable. At the time of this photo, she did have clean joints, tendons and ligaments, so that bodes well moving forward.